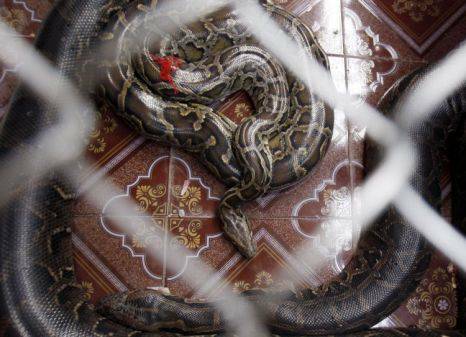 Two pythons have just got married in Cambodia. Hundreds of guests cheered for the fang-tastic ceremony believed to bring peace and good luck to villagers. The two-hour event in Svay Rolum, south Cambodia, ended with the 4.8m (16ft) ‘bridezilla’ and the smaller male – both believed to be magical – being blessed by two Buddhist monks. ‘We married these pythons to ask for health and prosperity in our village,’ said Chamrouen’s owner, 41-year-old Neth Vy. Many Cambodians subscribe to animism – the belief that spirits can inhabit all kinds of living creatures and inanimate objects.